Toyoko Inn Club Corporate Business Membership is a reservation service dedicated to corporate companies provided by Toyoko Inn and can be used free of admission and annual membership fee. *1 Discount rate is different in Toyoko Inn Marseille Saint Charles. Reduce cost for clerical work involving business trips. Check room vacancy, reservation, and booking history all in one! Room availability up to next six months can be viewed. Availabilities are displayed for each day in a calendar format. Simplify accommodation arrangement for travels of multiple persons. Reservations are displayed in a list, and cancellations can be made easily. Booking history is available to help with clerical work. 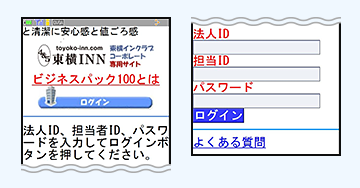 1.After logging in with the registered ID and password, click “New Reservation”. 2.Search hotels filtered by area, room availability, and check-in date and go to the reservation form after checking the availability of your room choice. 3.Insert required fields and click “Reserve”. Booking confirmation e-mail will be sent. Available for access from mobile phones! This is a service exclusive to corporations with an annual stay of over 1,000 stays. This is a service where Toyoko Inn accommodation fees can be paid for in a lump sum. A monthly bill (first to last day of the month) will be sent to partner corporations. This service is provided upon a signing of a separate contract between your corporation and Toyoko Inn. Toyoko Inn may not be able to fulfill all your requests due to our corporate policy conditions. For more information on Toyoko Inn Club Corporate, please contact the manager at the nearest hotel.